Well, hello November! Where did October go? Did this past month fly by for anyone else out there? I feel liked I blinked and I was watching my son dress up as a monster truck for Halloween (the sweetest little monster truck!). But alas, here we are at November and I am already planning holiday cards and thinking about gift giving! This year, I want to challenge myself and see if I can do all of my seasonal shopping locally. The goal would be to either purchase a locally made product or to support an independent small business in the area. I am hoping that this modest challenge will help me to shop mindfully this holiday season and explore more of the hidden gems that the DC area has to offer – such as the newly opened concept boutique, Shop Made in DC. Shop Made in DC is located at 1330 19th St. NW just off Dupont Circle. Shop Made in DC just opened last month and Washingtonian wrote a piece titled “This Cafe and Boutique is the Most DC Thing to Happen to DC.” Part restaurant and part boutique, everything at Shop Made in DC (from the yummy eats to artisan wares) is locally sourced and made. I knew I had to check it out! Just inside the door, I was struck by the gorgeous black and white prints created by French American designer Eva Calonder. She moved to Washington DC in 2011 and studied screen printing at the Corcoran School of the Arts. She applies her organic patterns to various textiles, notecards, and beautiful art prints. Arts prints by Eva Calonder (in the wire basket) are only $25 each. Intimately sized (just 8 1/2″ x 11″), these art prints are digital reproductions of Calonder’s original illustrations. In addition to her tropical and lush designs, I love that these are printed on high quality paper with high quality ink. On her website, she notes that “the paper is a 88lbs. soft white with a wove finish, free of elemental chlorine and acid” (translation: she uses the thick good stuff- this paper does not feel flimsy in your hands!). Even better, each one is priced at only $25! Up on the wall behind Calonder’s display is the work of Laura McGuigan. McGuigan lives in a 1920s row home in the DC neighborhood of Brookland. She has a background in graphic design and decided to commit fully to her professional art career two years ago. McGuigan’s abstract mixed media pieces convey a sense of movement with bold and energetic brush strokes and spray marks (from spray paint). You can feel these works being made, whether through the drips, pours, splatters, sprays, or brushed applications. 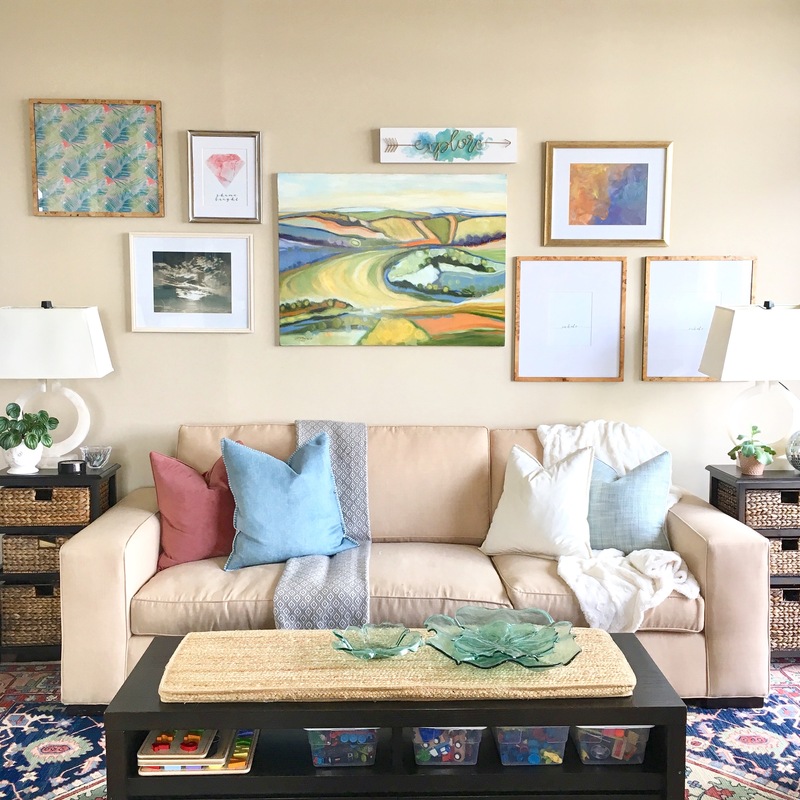 To give you a sense of her price point, the large original artwork in the middle (above) measures 36×36 in. and is priced at $1000. She also does small original works on paper and an unframed 9×12 in. paper piece is $85 (I do a little happy dance every time I find interesting original artwork listed at affordable prices). Other merchandise for sale at Shop Made in DC includes soaps, candles, jewelry, adorable baby clothes, t-shirts, greeting cards, and more. These hand-pulled four color screen prints by Anthony Dihle are part of a series titled the DC Neighborhood Project. Tucked away in the back of Shop Made in DC is a standout display of works by Anthony Dihle. I learned from Dihle’s business website, Victory Dance Creative, that these prints make up the DC Neighborhood Project, “an ongoing series created to show off and commemorate Washington DC outside of the typical views of the Capitol Building and monuments.” They are “hand-pulled four color screenprints on high-quality cover weight poster paper” and sell unframed in the shop for $25 each. The bright colors and graphic designs are eye-catching. Displaying one would be an awesome reminder of a favorite DC neighborhood. Displaying them altogether like this makes an impactful (and budget-friendly) wall installation for those who love this city! I had such a good time on my first visit to Shop Made in DC! The food was also delicious and the recipes, though made in DC, have international origins. I tried a little sampling of tacos filled with adobo-braised brisket and chimichurri sauce, red coconut beef curry, and Tibetan-style dumplings soup. This is good food for cold days. These recipes are flavorful (and a touch spicy) and will warm you right up! You can visit Shop Made in DC Monday through Friday 7AM to 8PM and on the weekends 11AM to 6PM.